Here is a short tutorial on how to bring the missing graphical Windows Experience Index tool back in Windows 8.1. The Windows Experience Index is a benchmarking tool that measures your system’s performance and uses a Base Score to rate the expected experience. A higher Base Score means your system will perform faster and will be more responsive than systems with a lower Base Score. Although this score is never so accurate, it can still be used as a useful measure to find which hardware components are performing slower and need to be upgraded, since it is an average of the Sub Scores of the individual performance of your system’s Processor, Graphics, Gaming Graphics, Memory (RAM), and Primary Hard Disk. The Windows Experience Index was first introduced when Microsoft released Windows Vista. It continued to be there in higher versions of Windows, however for some reason, Microsoft decided to remove its graphical user interface in Windows 8.1. Though you can access this benchmark utility in Windows 8.1 using the command prompt, we have found a brilliant tool that brings the graphical Windows Experience Index back to Windows 8.1. Known as ChrisPC Win Experience Index, the tool is pretty much identical to the original Windows Experience Index tool, and can be used to view your system’s Windows Experience Index. ChrisPC Win Experience Index is available as a free tool and can be downloaded using the link given at the end. Though it is specially designed for Windows 8.1, it also supports Windows 8 and Windows 7 operating systems. To use ChrisPC Win Experience Index, simply install and launch the tool. As you do this, it will automatically scan your whole PC and display the Base Score of your system. This Base Score will be the average of Sub Scores of the individual hardware components, including Processor, Graphics, Gaming Graphics, Memory (RAM), and Primary Hard Disk. A Base Score of up to 2 shows that your system can perform basic tasks like text processing or web browsing. A Base Score of at least 3 is required for running the Aero desktop experience. A Base Score of 4 or higher is required for graphics-intensive software. There’s a Re-run the assessment button available below this Base Score which can be used to re-calculate your PC’s Windows Experience Index whenever needed. 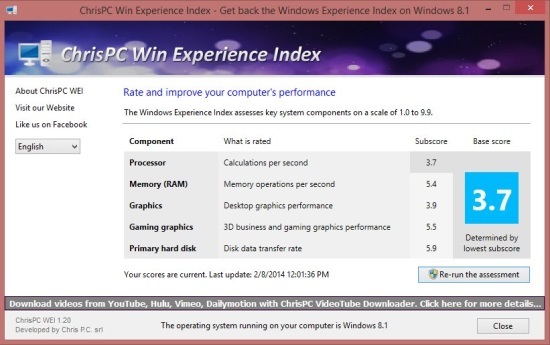 Free tool to view Windows Experience Index in Windows 8.1. Available in two languages: English and Romanian. Also check how to fix the pending status in Windows Store. 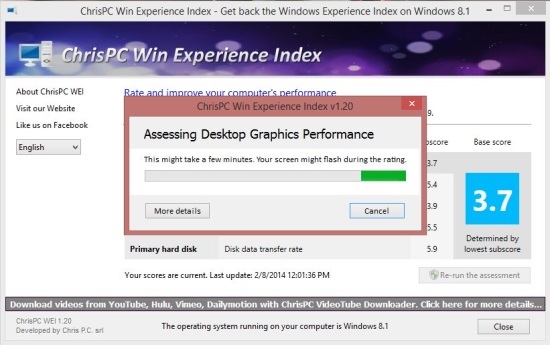 ChrisPC Win Experience Tool is perfect tool to view the Windows Experience Index on your Windows 8.1 system. It’s graphical user interface, quick access, and one-click results, makes it a must have for all those who are looking for the WEI benchmark tool on their Windows PC. Try it and share your feedback via comments. Get ChrisPC Win Experience Tool here! Don’t forget to check some free calendar apps for Windows 8.